The new age Toyota vehicles look quite aggressive but they sure do not look as eye-catchy as the Lexus SUVs. The Toyota Fortuner is a global vehicle and is quite popular in the international markets too. 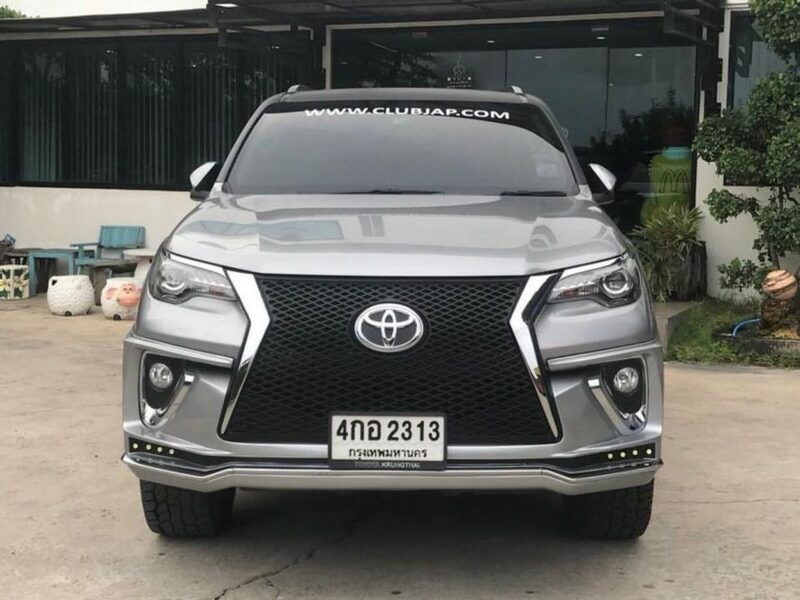 There are many examples of people upgrading the look of their vehicle with the Lexus grille and here are five such modified Toyota Fortuners with Lexus grille. Most of these grilles do not need any physical modification of the vehicle and they can be fitted directly to the vehicle’s existing hooks. This is not the exact copy of the Lexus grille but it draws inspiration from the luxurious Lexus SUVs. This front grille quite large when compared to the stock and the height is from the boot lid to the bumper. 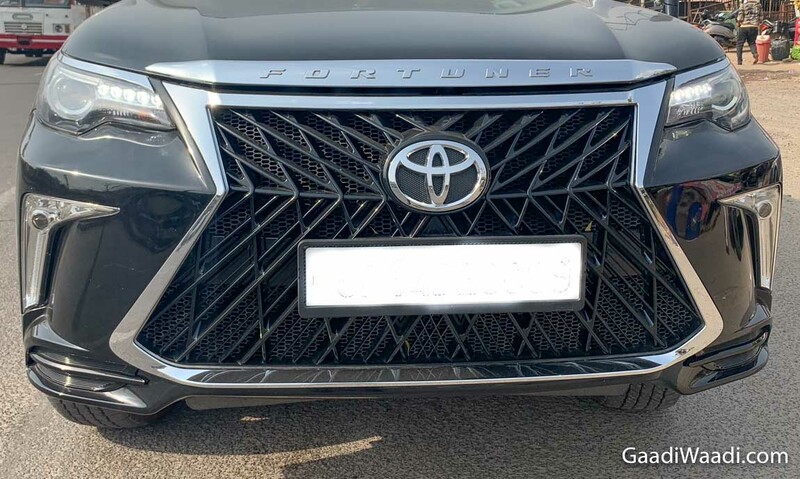 There are multiple horizontal slats in the grille that gives an “in your face” look to the Fortuner. With the new grille, the bumper has also been updated too. Both the boundaries of the grille get thick chrome outlining and further add a premium look to the vehicle. 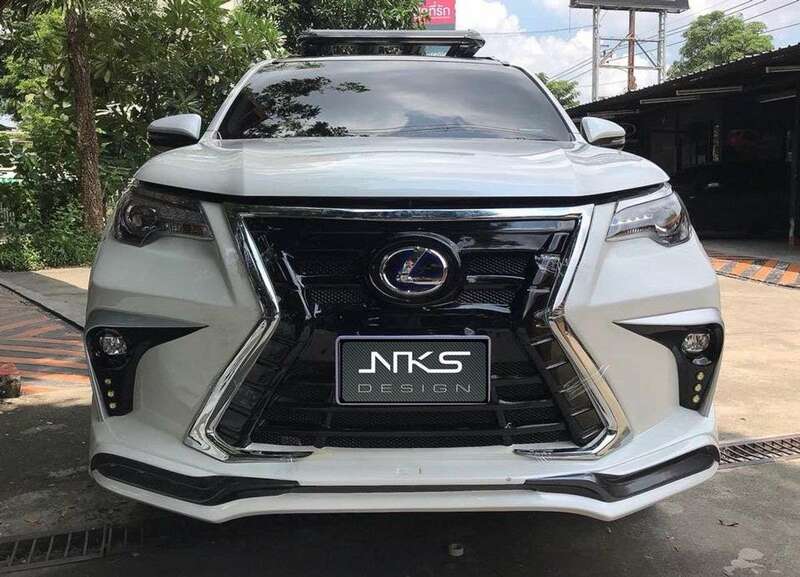 The NKS Design is a Thailand based firm that offers a wide range of modification options for the Toyota Fortuner. 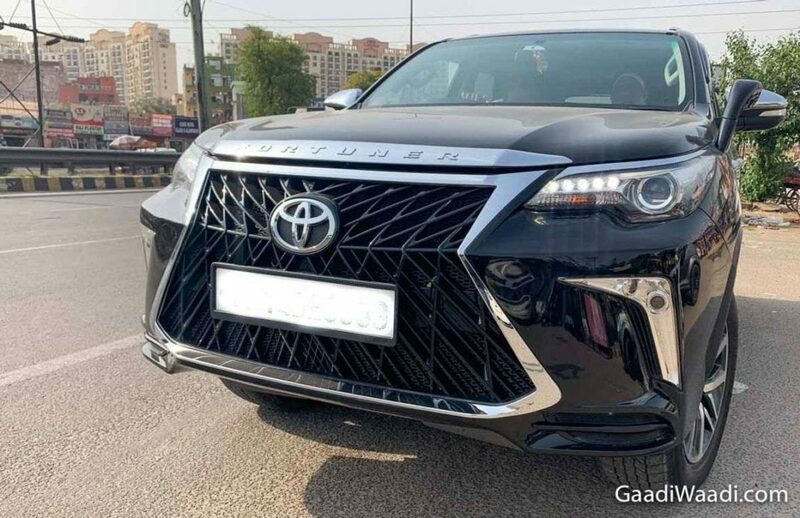 Here is a Lexus-inspired grille that looks much more aggressive and is slightly different in shape. It gets an exact hourglass shaped black grille with a thick chrome boundary around. It even gets a Lexus logo at the front that will confuse many non-car enthusiasts on the road. This particular vehicle also gets a body kit from NKS. At the front, it gets a bumper spoiler with black inserts that looks quite good. 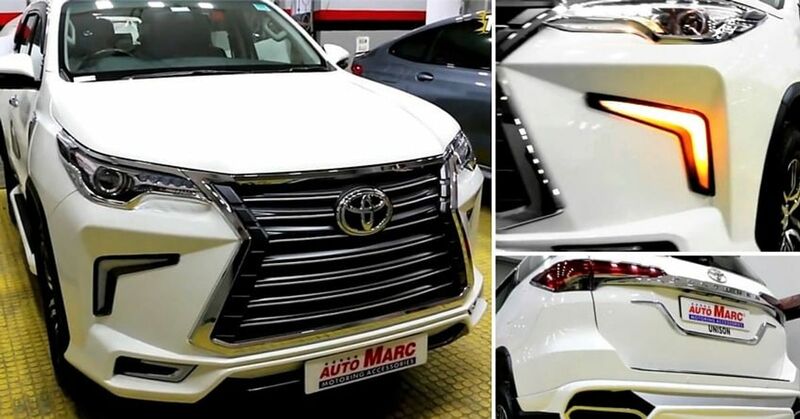 This iteration of the Lexus grille for Toyota Fortuner looks sublime! 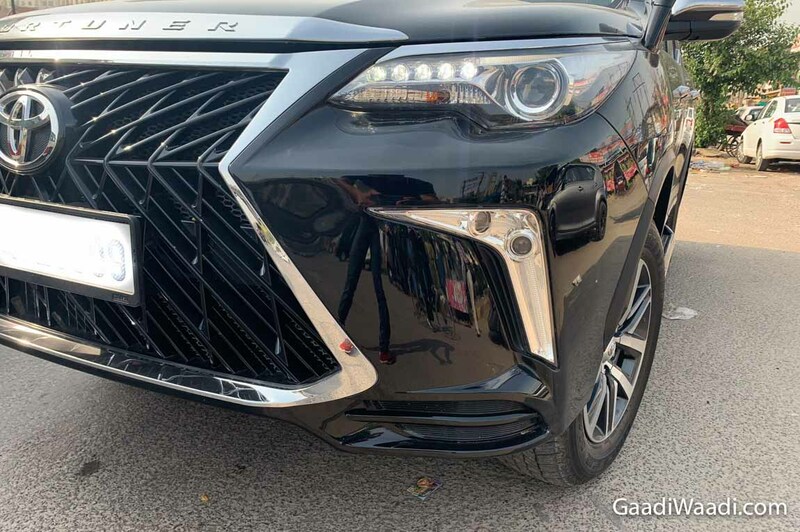 The shape of this grille is very much similar to the Lexus vehicles but it is not as loud as the other aftermarket Lexus grilles available in the market. 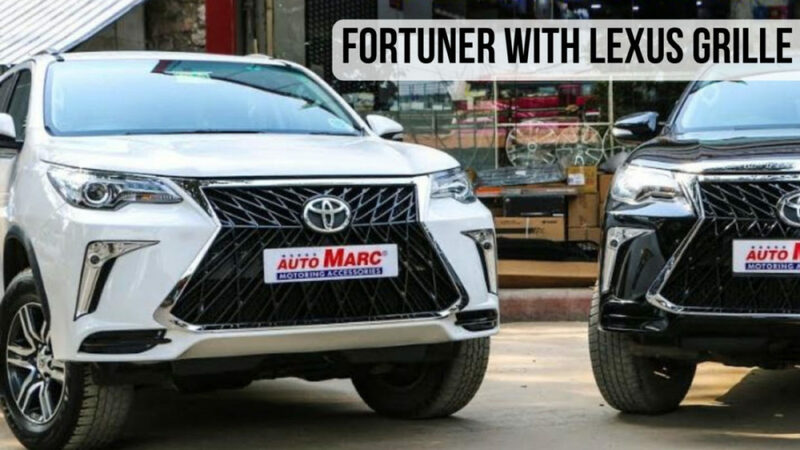 The use of this grille also keeps the Fortuner’s original DNA intact for the front-end as it keeps the stock fog lamps with the chrome elements around it. Down below, it gets an aftermarket bumper with a spoiler and there are integrated LED lamps that add to the overall aggressiveness of the SUV. On the sides, there are chrome stripes bracketing the grille but they do not catch much of attention keeps everything simple yet very sophisticated. 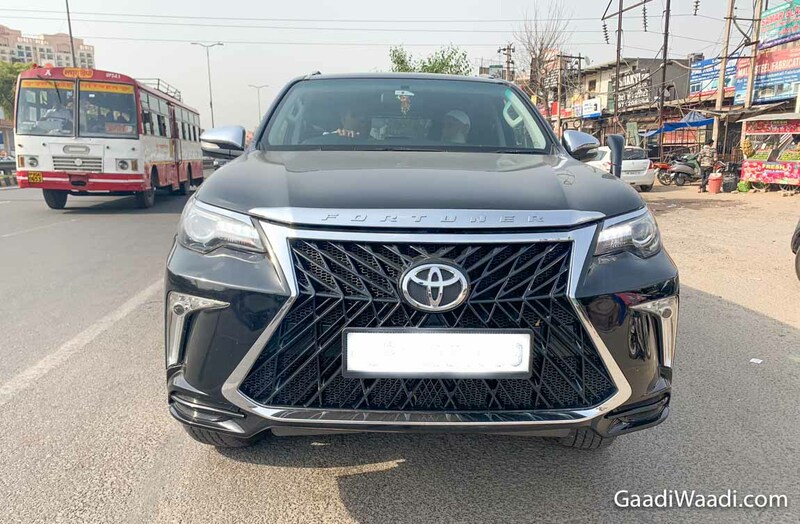 The new-age Lexus vehicles are designed to grab all the attention on the road and it is the grille of the Lexus vehicle takes care of the same. Here is a grille that is truly inspired by Lexus LX 450d SUV and it comes in the famous spindle grille design. The spindle grille was introduced after Lexus wanted to make the vehicle more attractive to the youths but it was disliked by many. The stock grille of the Lexus 450d is not a spindle grille but it does hets the hourglass shape. This spindle grille in hourglass shape has a captivating effect that can stop traffic. It also looks intimidating on the road, especially if the vehicle is viewed on the rear view mirror! This grille makes sure that the vehicle does not go unnoticed in any situation. This Delhi-based modification garage offers various types of grilles for the all-new Toyota Fortuner. 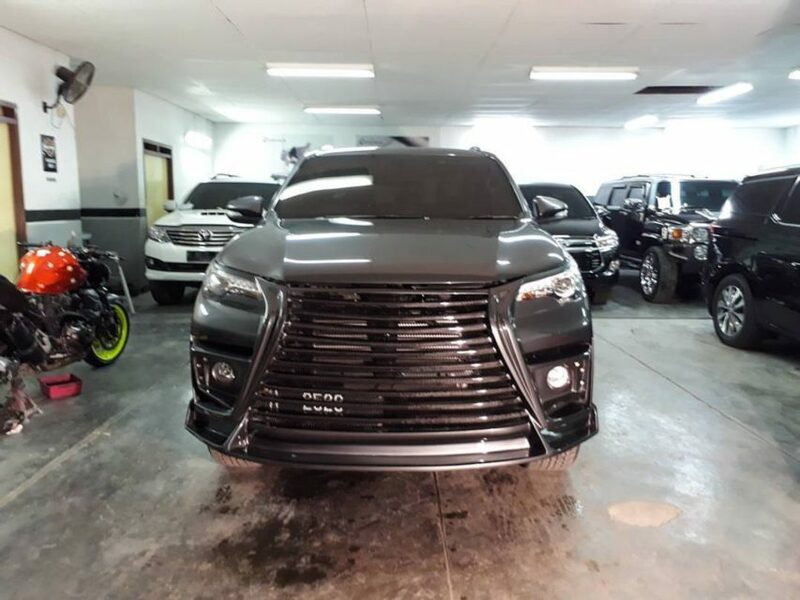 This particular grille looks like a quality first copy of the Lexus grille. It is not only the grille that enhances the look of the Fortuner. It gets a body kit that makes the vehicle look ludicrous on the road. 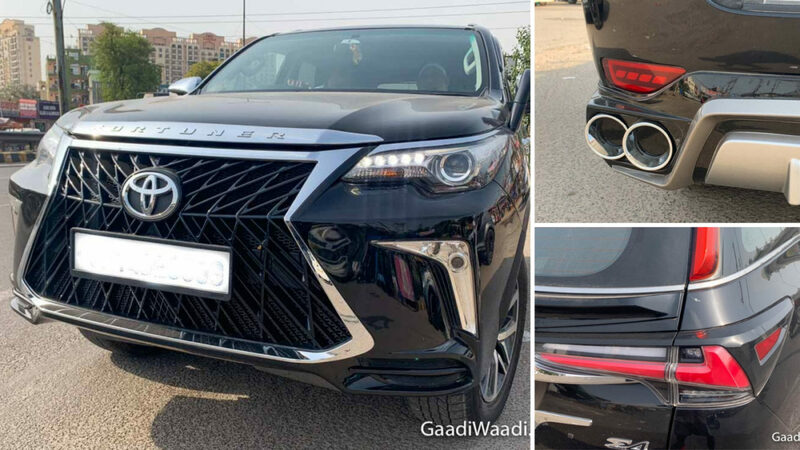 The enhancements like bumper integrated LED fog lamps in an angular shape, front bumper spoiler, rear bumper spoiler and even Lexus styled tail lamps can confuse any onlooker who is not well-versed with car and SUVs.